May 2013 - New York - He's a cop... with an axe... he's AXE COP! He's the best crime fighter the world has ever known thanks to his trusty axe, his pet T-rex, Wexter (with maching gun hands!) and a group of crime-fighting partners unlike any you've ever seen! 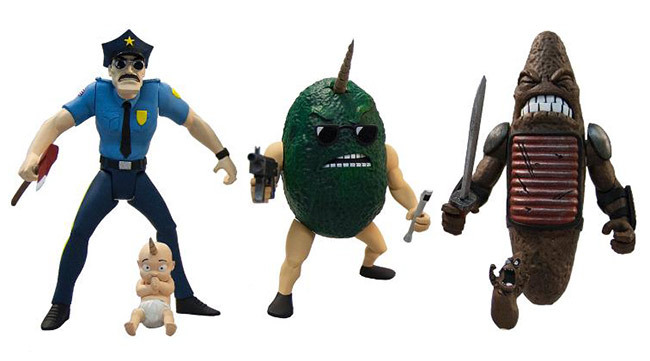 Axe Cop - The star of the show, with axe, poopsucker gun (to help him conquer Planet Poop), Uni Baby, and lemon grenade (all the explosive power of a regular grenade but with a lemony freshness). Dr Doo Doo - One of Axe Cop's many arch enemies, with Doo Doo soldier, and sword. Also includes clear stands to create the "hover" effect.